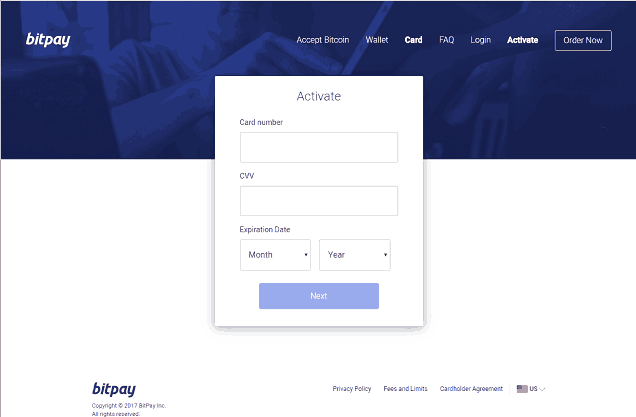 If you're an American poker player who uses Bitcoin or Bitcoin Cash on a regular basis, then the BitPay Visa card could be a valuable tool for you. Many online poker fans have come to realize that Bitcoin transactions are the way to go, but there are certain inconveniences with using digital currency, like being unable to convert your coins into ready-to-spend cash in a timely way. 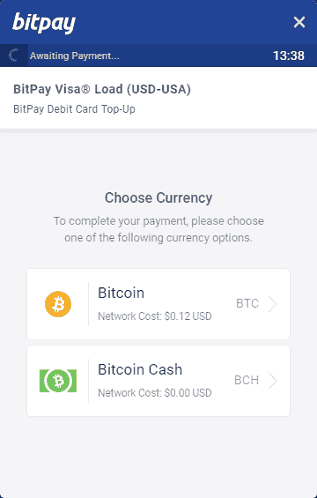 The BitPay Visa card lets you change your bitcoins and Bitcoin Cash into USD and then buy goods and services anywhere that Visa is accepted. 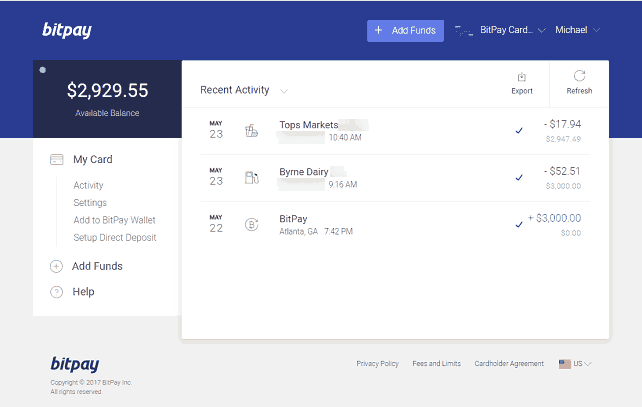 How Does the BitPay Visa Card Work? After you get your card in the mail, you fund it by sending your bitcoin to an address generated by BitPay. Once there's a single confirmation of this transaction, your BTC or BCH will be converted to U.S. dollars and loaded onto the card. You can then make credit and debit purchases just like you would with any other Visa card. When your card balance gets a bit low, it's easy to increase it by simply sending more bitcoins to it. What Are the Advantages of BitPay Visa? Bitcoin exchanges, like CoinBase, charge you a fee for buying and selling cryptocurrency. 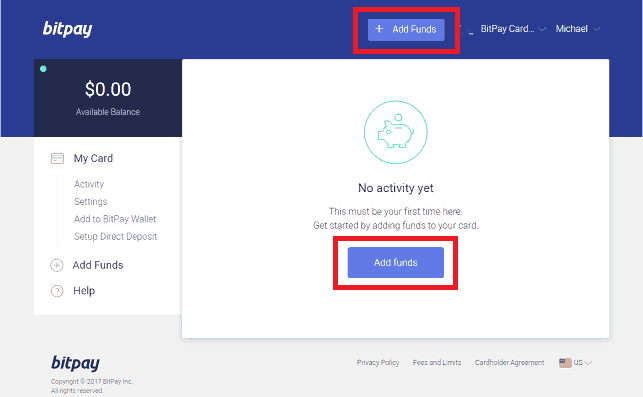 However, the BitPay Visa allows you to avoid these charges because the coins you send to it are converted to USD automatically. You don't need to pay anything extra when you use it to buy things either, and you can receive cash back from merchants on your debit transactions without any additional fees. It's possible to withdraw money from ATMs with the card too, but you will have to pay $2 ($3 internationally) plus whatever the owner of the ATM charges. 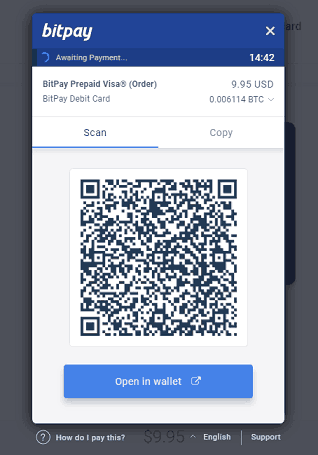 It costs $9.95 to get the BitPay card, and there are slight surcharges levied on the Bitcoin transactions you make to buy or fund your card. Beyond these minor expenses, ongoing fees are minimal and can be avoided entirely. There's an account dormancy fee of $5 per month, but you can simply make a purchase or ATM withdrawal with your card at least once every 90 days to keep your account active. Because it is a Visa card, you'll receive all the advantages normally associated with such cards. This includes the zero liability protection against unauthorized transactions that Visa provides to all its cardholders. 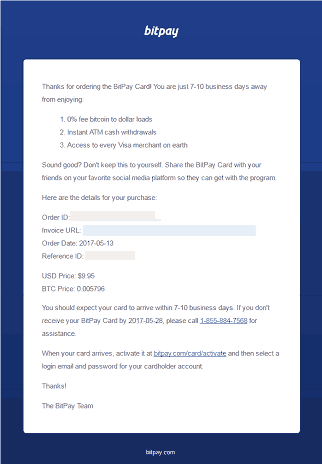 Since PayPal allows you to pay with Visa, you can effectively make any PayPal purchase with the BitPay card. What Must I Have to Get a BitPay Visa Card? Before obtaining the Visa card from BitPay, you must have the $9.95 purchase price ready to pay. You can only pay it in Bitcoin or Bitcoin Cash, which means that you should have a wallet with at least this amount in it. Actually, it's best to have around $15 or so available in your wallet to account for possible price fluctuations and miners fees. BitPay does offer its own wallet, but we recommend the Blockchain.info wallet because it has been around for a long time and has millions of customers. If you don't yet have a wallet, then you probably also lack bitcoins, so you may wish to open an account at CoinBase or another Bitcoin exchange. 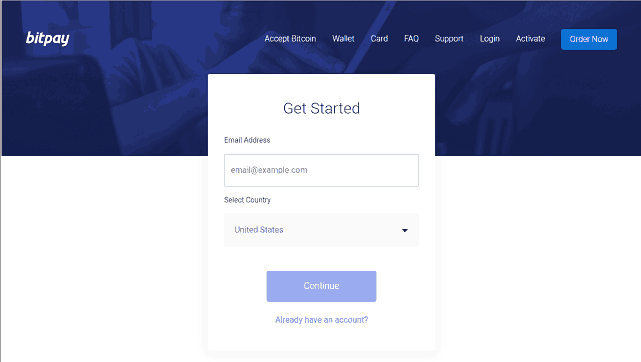 Look at our guide to getting started in Bitcoin for instructions on how to create a wallet at Blockchain.info and join up at CoinBase. You must be willing to divulge your Social Security Number in order to apply for a BitPay Visa. This is because the card is issued by Metropolitan Commercial Bank in New York, which is subject to all the laws and KYC (Know Your Customer) regulations that apply to financial institutions in the United States. It's a breeze to go through the process of getting a new BitPay Visa card. Although there are many individual steps you need to take, we've broken them down for you so that you can easily complete them. If you'd like to view the instructions in video form, then simply watch our how-to guide below. Or continue reading for detailed information in text form. 3. In the form that you see, you'll have to enter your shipping, identification, and account info. When you're done, check the box agreeing to the terms and conditions. Then press the “Continue to Payment” button. 4. You'll receive a message stating that your application is complete, and you'll be prompted to send the required $9.95 cost for the card. You can choose to pay via Bitcoin or Bitcoin Cash. Before making your decision, you'll see what the network cost will be for each of these crypto-currencies. This network cost represents the miners fees that BitPay must incur to sweep the money you send it into its wallet accounts. Thus, you have to pay both your own fees as well as BitPay's. For the remainder of this article, whenever we refer to sending BTC, we mean your choice of crypto coin either Bitcoin or Bitcoin Cash. It would take up too much space to list out both digital coins every time we talk about them, so you can mentally replace “BTC” with ”BCH” whenever appropriate for your situation. 5. 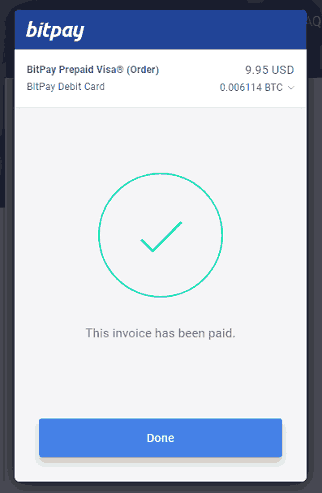 After choosing your coin of choice, you'll see a BitPay invoice indicating the amount you have to pay in both USD and BTC. The actual value of the transaction when all is said and done might be a couple of dollars higher than the stated $9.95 because of the fact that you must pay the network cost.. Note that BitPay uses something called the Bitcoin Payment Protocol. Thus, the addresses it generates don't look like normal BTC addresses but rather appear similar to website URLs. The Payment Protocol helps protect you from mistakes because it won't let you send the wrong amount of bitcoin or send it to the wrong place. However, your wallet must be compatible with this feature in order to work with Bitpay. The blockchain.info wallet, unfortunately, does not yet support Payment Protocol, but there are a number of excellent wallets that do, including Electrum. 6. Next open up your Bitcoin wallet and send the required amount to the address displayed. If you're using a mobile wallet, you can scan the QR code. Otherwise, go over to the “Copy” tab and copy the address over in text form. You must initiate the payment within 15 minutes. If you fail to do so, the amount you have to send might change, but you won't be penalized in any other way for letting the countdown expire. 7. Even after you send the correct number of bitcoins from your wallet, your transaction must confirm at least once before BitPay will recognize it as having been paid. In the interim, you'll see a notification similar to the one on the right. If you really want your BitPay card as fast as possible, it might be worthwhile to bump up the miners fee in your wallet particularly during times of network congestion. 8. All transactions require "confirmations" from other sources on the network's blockchain. These confirmations are often rapid and done in minutes. 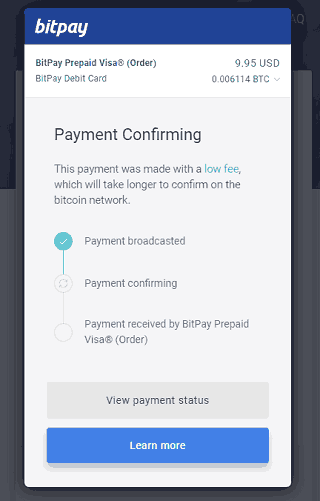 Once your BTC transaction has been confirmed by the Bitcoin network, BitPay will show you a confirmation message. 9. Your order will be processed within one day. When it's done, you'll receive an email with the details of your order. You'll have to wait 7 - 10 business days for your card to arrive in the mail. It will come with a copy of the cardholder's agreement and a PIN number. This PIN is useful in case you wish to make debit card purchases or withdrawals from ATMs. 11. 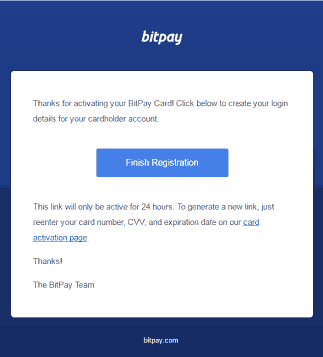 Go back to your email account and click on the “Finish Registration” link that BitPay sends you. You have 24 hours to do so. If this time period elapses without your having completed the registration, you can simply go back to the activation page and enter your details in again. 14. Log into your account with your email address and the password you had just created. 15. Upon logging in, you'll see your account history, which will be blank at this point. The first thing you need to do is fund your card. Select “Add Funds” near the top of the page or in the middle of your screen. 17. BitPay will generate an invoice based on the amount you've entered. 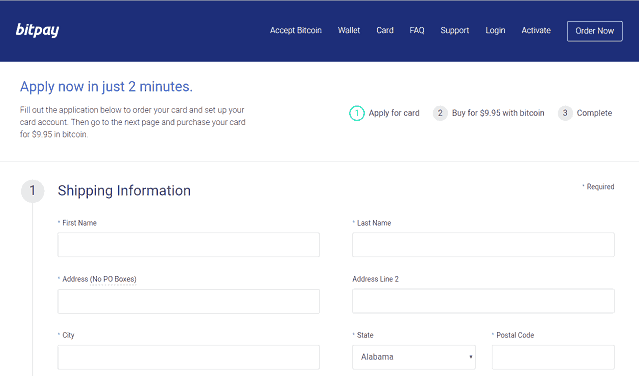 To pay this sum in BTC, just follow the same steps (#5 - #8) that you did to pay the $9.95 charge for your card earlier. 18. When you return to the account history, you'll see the appropriate sum credited to your balance. Now you're ready to make purchases with your card just like any other prepaid debit card. Remember to sign the back of the card first though because it's not technically valid until you do so. 19. As you use your card, your recent activity will be updated to reflect all your transactions. View your available balance in the top-left of the page. 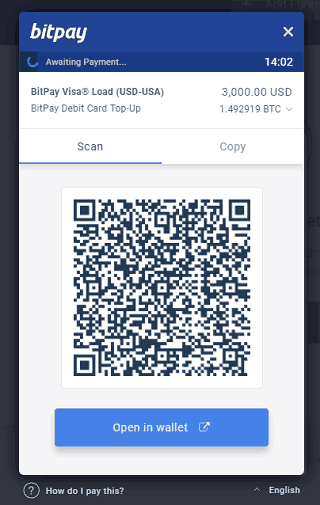 We've only just scratched the surface of the capabilities of the BitPay prepaid Visa card. You can set it up for direct deposit from your place of employment, obtain a secondary card, and load cash onto your card with GreenDot or Western Union. Most of these functions are not frequently demanded by most individuals, and they do cost you a little bit. Still, it's good to know that the BitPay Visa is a versatile, fully featured debit card. 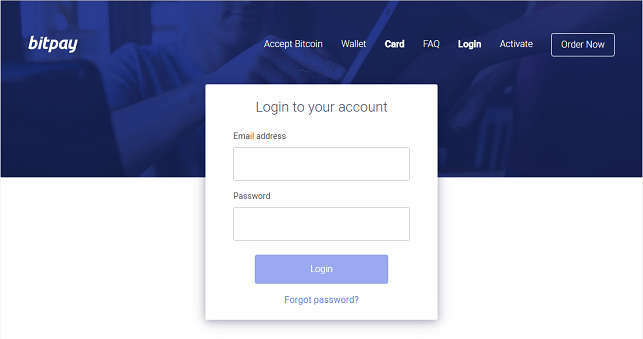 Though the Bitpay Visa card is an invaluable tool for anyone transferring money to and from gaming sites, a word of caution is in order. Don't use your card to make deposits directly to internet poker sites or to claim your winnings from such sites because these activities might cause your account to be flagged for closure. Always use an intermediary wallet, like Blockchain.com, to transact with the poker companies. The Bitpay terms and conditions contain language precluding customers from using its services for gambling purposes. Just look at this incident reported on the Twoplustwo forums to see what could result from breaking this rule. 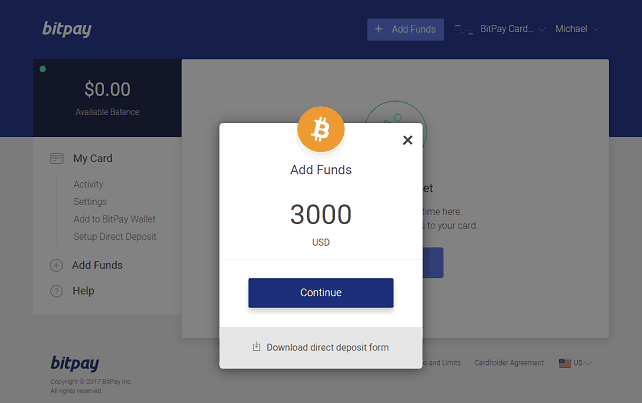 If you open up a Bitpay crypto-currency wallet in addition to obtaining the company's Visa card, we recommend that you exercise similar caution when sending your funds to the Bitpay wallet.